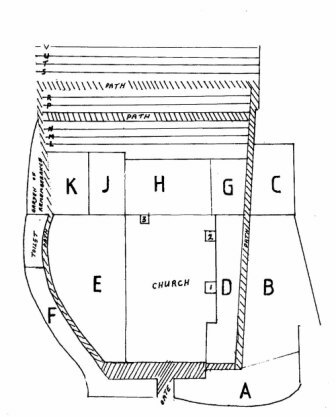 For the purposes of the survey the church yard was sectioned as shown in the plan below. Graves are numbered within each section. Click on the letters below the plan to see sections in more detail. 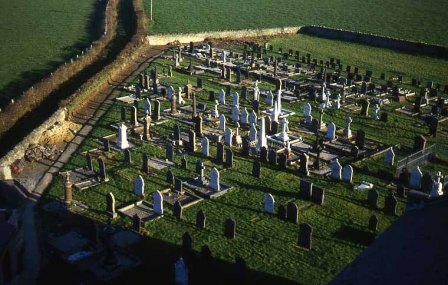 Details of inscriptions relating to more recent burials in sections S-V can be found in the survey documents held in Ceredigion Archives at Aberystwyth. Spellings are as recorded on the stones and are not necessarily accurate. On Thursday 30th July 1846 between one and two in the afternoon part of the churchyard was damaged by floods, and the following Sunday it became stormy again and eight feet of the wall was destroyed and part of the churchyard was washed away. Five of the coffins were rescued and re-interred. A14 Jenkins John 27-2-1862 6 Son of the above. A20 Pugh John 12-1851 7 month Son of the above. B3 Jones Mary 12-3-1837 43 Constantinople Wife of Evan. B6 Hughes Anne. 2-5-1924 68 Daughter of the above. B8b Benjamin Evan 25-7-1891 80 Mile End. B17 Jones John Alban 10-1-1885 7 months Son of the above. B19 Williams Catherine 7-4-1893 75 Wife of the above. B22 Davies William 13-11-1856 86 Former Penlon Rest of stone buried. B27 Jones Mary 12-7-1874 35 Levant House Wife of John M.M. B32 Evans Mary 9-2-1860 17 Siberia Daughter of John and Mary. C3b Rees John. Daniel. Wynne M.D. 45 Died Baltimore. U.S.A.
C7a Griffiths Hugh 25-11-1829 7-1-1894 Married 23-7-1858.Late officer of Fort William N.B. C11 Lewis David Rev. 21-2-1927 81 Vicar of this parish for 32 years. 1888-1920. C17 Jones David M.M. 13-11-1880 56 Engrateia Drowned in this Bay. C19 Jones Anne 18-10-1854 39 Daughter of the above. Died in Shipwreck Liverpool. D1 Very old stone, badly worn. D13 Alban Mary 7-10-1788 29 Daughter of John and Anne. D19 Evans Margaret 7-12-1907 70 Wife of Jenkin Evans. Tyn-y-Cwm. D21a Morgan Elizabeth 7-8-1878 33 Wife of Thomas. M.M. D25 Davies John Emrys 6-5-1883 4 Weeks Son of David. (Police officer)and Margaret. E5 Jenkins Catherine 7-10-1873 82 Bont Wife of Daniel M.M. E8 Morgan Elizabeth 5-10-1850 21 Daughter of John and Jane. Mason. E14 Evans Mary 20-7-1900 75 Friends Wife of David M.M. E16 Lewis David 17-3-1872 20 Son of David and Hannah Died Pernambuco. Brazil. E40 Jenkins Evan 7-5-1847 14 Son of Daniel and Anne. Drowned off the Isle of White. G5 Richards Anne 5-3-1867 58 Panteg Wife of David M.M. G8 Jenkins Eleanor 17-9-1883 42 Panteg Wife of Lewis M.M. G17 Evans David 30-11-1834 2 Son of Evan M.M. and Catherine. G32 Davies Eleanor 2-11-1849 59 Wife of David M.M. G33 Davies Lewis 1887 1931 Wellington Chief Engineer. M.N. H28b Davies Evan Rev 20-10-1903 40 Son of Daniel and Margaret. Curate of St. Johns. Kilburn London. H34 Davies Jane 4-12-1895 44 Taihirion Wife of Enoch M. N.
H35 Owens Anne 11-7-1845 56 Wife of the above. Rest of stone buried. H39a Owens David M.M. Died and is buried Alicante Spain. No date given. H39b Owens John 6-3-1842 3 Son of David and Jane. H47b Lewis Catherine Anne 27- 1- 1913 42 Osbourne House. Aberdovey Daughter of John and Anne. J8 Davies Evan Samuel 2-10-1894 3 year 3 Months Son of Lewis and Mary. J22 Jenkins Evan William 24-12-1937 60 Son of the above. 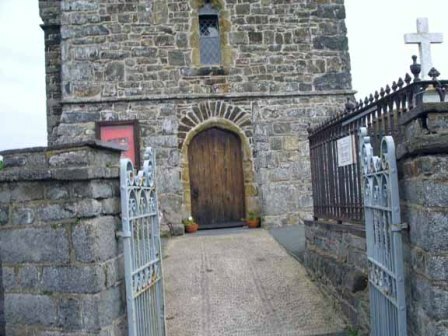 Vicar of Llanarnon Mold for 17 years. also their children. J38 Jones Mary 5years 3 Month Late of Tyncwm Daughter of Jenkin and Jane Jamaica Road London Buried in Llanon 25-7-1883. K7 Jones Margaret 2-5-1894 60 Euston House Wife of Evan M.M. K7 Jones Martha 18-1-1899 24 Daughter of the above. Also a son who died in infancy. K31 Davies Anne Marina 30-7-1894 8-8-1896 Clifton House Daughter of Rev.E.C.Davies and Margaret Jane. K37 Jones Anne Jane 8-5-1924 50 Daughter of the above. K38 Thomas Daniel Ernest 26-7-1907 29 Son of the above Interred Moss Point cemetery Pasgacdula U.S.A.
l2 Jenkins Henry Lloyd Lt.Com 14-1-1928 61 Son of Henry and Anne. R.N.R. L17 Davies Evan 18-12-1920 51 Pencnwc Penant. P31 Beckett Henry Etna 12-8-1886 29-5-1887 Son of the above. Buried in Trinidad Colorado U S A.
P52b Evan J.O. Rev 4-12-1928 64 Rector. new Moat Clarbeston for 28 years. R4 Jenkins William 2-10-1961 66 Shipping Begelly Pembs.